Just do it! Just Burning Rangers! "They are Burning Rangers, go!" Burning Rangers is a Third-Person Shooter (of sorts) on the Sega Saturn. 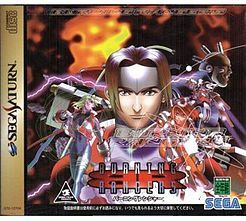 Developed by Sonic Team and dreamed up by Yuji Naka (and others) this game is perhaps the best in-house Sega game for the Saturn. Set in the near future as we follow an elite team of fire-fighters. They respond to any major incident by: hopping into their spacecraft, teleporting down, subduing the fires by shooting lasers at them and reducing them into crystals, using their jetpacks to navigate the terrain, before finally teleporting the survivors off onto their spaceship. Throughout the game we fight malfunctioning robots and save people in: a factory of some sort, an underwater aquarium, a orbiting space station and a man-made asteroid. On the asteroid is a young girl was suffering from an incurable disease, placed into stasis and sent into space with a powerful AI to monitor her situation and any progress on the cure. However once the AI finds out a cure has been found it sends the asteroid on a collision course with earth and is also, somehow, responsible for the disasters that have been taking place in the game. Its up to the two young rookies of the team to save the girl, save Earth and teach children about the dangers of naked flames. While the game hasn't received a sequel and is potentially the least successful game Sonic Team has ever made, it's still fondly remembered to this day and receives cameos and references in some of Sega's games. (Especially the songs.) Yosuke Okunari, head of Sega's recent re-releases, has stated that if NiGHTs HD sells well, he will attempt to propose a HD re-release of Burning Rangers as well. The ball is in your court, fans. All There in the Manual: The characters actually have quite a bit of backstory to them, such as Big's robotic parts resulting from a previous accident in his career and Chris's motivation for being a Ranger due to the death of her father. Award-Bait Song: "I Just Smile ". Image Song: The song is seemingly sung from Iria's perspective, talking about how she can't return to the time before she slept, yet she is able to smile and look to the future as the Burning Rangers now accept her as family. Badass Crew: These guys will brave all hazards and fire outbreaks to rescue survivors. Woe betides anyone who tries to stop them. Bragging Theme Tune: "We are Burning Rangers ". Creator Cameo: Yuji Naka is one of the civilians you have to save in the levels, as well as several other Sonic Team members. "Get Back Here!" Boss: The 3rd boss in the game has you chasing it throughout a tunnel the more you damage it. Glass Cannon: While badass enough to combat raging fires, getting hit once by anything would cause the playable Ranger to drop all their crystals; getting hit without any results in a Game Over. Heroic Dolphin: Ends up directing you through the underwater sections and even rescuing you at the end of the second level in return for you saving it earlier on. Heroic Fire Rescue: But of course! "Save the World" Climax: At first you're just responding to fire outbreaks in order to rescue trapped survivors. However, near the end of the game the Rangers discover a giant space station that is collecting space debris from across the galaxy that's on a crash course with Earth. You therefore have to quickly head into the ship's central core in an attempt to destroy the ship from the inside and save the world. Shout-Out: Health in the game is handled with crystals; as long as you have one crystal on hand which can be dotted throughout the level or from fires you've extinguished, you cannot die. Where have we heard this before...? The third stage has sectors throughout the level named after stages from NiGHTS, such as Twin Seed St. You can also rescue Elliot and Claris at some point in the game, and they will send you emails thanking you. Burning Rangers itself has become this within many Sonic Team games, such as Phantasy Star Online and Sonic Pinball Party, and it even received a track in Sumo Digital's Sonic & All-Stars Racing Transformed. Fans believe that the English version of "Angels with Burning Hearts" sneaked in a Shout-Out to Sonic Team themselves in acronym form. ("Sight of night I cheer to embrace a magic") This is not true; the line goes "Sight of night I cheer to embrace the magic". Title Theme Tune: A very Ear Worm one at that.